This is one of my favourite things to do with nail art and probably the most simple concept and that most people own and can do with both hands easily. Literally all you do, is paint your nails white or which ever base colour you would like, then decide which way you want the triangle to go and paint a line diagonally across your nails and fill it in with glitter polish. It is amazing with all kinds of combinations and would look amazing on new years with black and gold glitter or silver or anything. I feel like if you are interested in nail art it is a prerequisite to love glitter, and this is so simple and looks amazing that everyone should try it with their favourites! 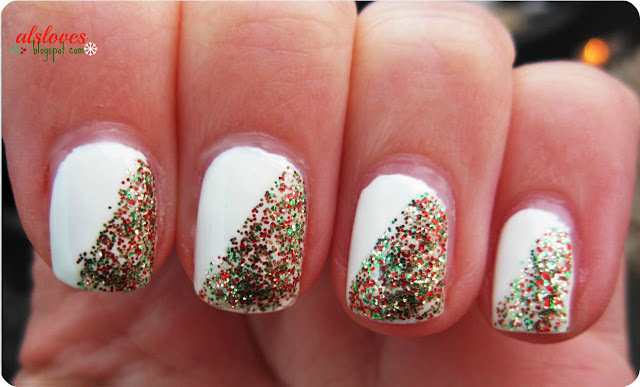 The colours used were Sally Hansen XtremeWear in White On and China Glaze Twinkle Lights! Let me know what you think, and if you have a blog or instagram that features your nail art I would love to see what you did this holiday season!